Two years after announcing their breakup Graveyard makes a very welcome return with their new album Peace, which finds the band joined by a new drummer, Oskar Bergenheim, and with a fresh and inspired new take on their heavy “riffs n’ hooks’ sound that finds them adding more soul and songcraft to their music and making Peace a worthy companion to Graveyard’s highwater mark 2012 album Lights Out. Opening track “It Ain’t Over Yet” makes a statement in both sound and song title, that Graveyard are back with a vengeance. Guitars grind, drums crash, the bass thumps and the vocals wail as they come roaring out of the gate at full speed, letting the world know in just under four minutes, that this band is taking no prisoners and ready to shut up any naysayer that dares to think differently. 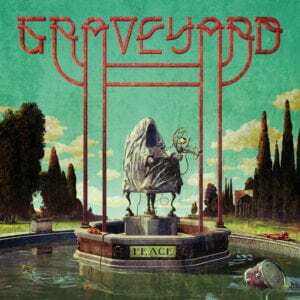 One of the best things about Graveyard and what differentiates them from so many of their contemporaries is their ability to blend different musical styles and sounds; Graveyard’s music rewards you with every repeat listen. In other words their albums have legs – and Peace is no exception, finding the band seamlessly blending rock, soul, 60’s acid fuzz and of course a big dash of heavy metal into an infectious musical stew that finds one pressing the repeat button instead of moving on to some other band. “The Fox” is a perfect example of this diversity as guitarist Jonatan Ramm blasts out a fuzz pedal riff that would feel right at home on some lost 60’s garage rocker. Joakim Nilsson’s soul drenched wailing vocals and a hooky chorus transports the song into the stratosphere before the guitar again takes center stage on the outro. This is one track I can’t wait to hear them perform live. This is a killer of an album, and a real return to form for Graveyard. If you’re new to the band check out the Peace album. If you’re a longtime fan, you’ll probably bought this on release day.